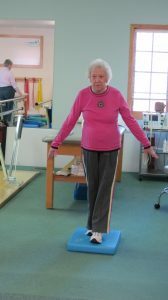 Strength & Stability Class Now Offered in Sandwich! Northern Rehab excited to announce we are adding the Strength and Stability Class to our Sandwich location! These classes focus on balance activities to improve balance, flexibility, strength, prevent falls, enhance energy levels, increase confidence of performing daily activities, and more. Classes meet in our DeKalb Sycamore Road and Genoa locations, and now are available at our Sandwich location as well! The Stren gth and Stability class meets on Tuesdays/Thursdays from 12:30 pm – 1:30 pm at the Sandwich clinic located at 523 E. Railroad Street and is led by physical therapist, Andrea Carter. These classes run for 5 weeks and include 10 sessions. Sessions repeat every 5 weeks with the opportunity to renew enrollment each session. This session begins May 15. Class fees are $60.00 for 10 sessions. Registration is now open! Space is limited and classes fill quickly, so please contact us at 815.786.1888 for more information or to register. We can help you regain your freedom to move!